Love the food connection, but why the hate for the comma? I get it. Humorous. Hahaha. Even this grammarian can take a joke. But then I started to think about how the Oxford comma gets a lot of slack and I wanted to find more of these comma misfires. And then I found this, also foodie-friendly: “My usual breakfast is coffee, bacon and eggs and toast.” This one is a good one, a common issue for writers that requires you to rearrange the words to something like, “My usual breakfast is coffee, toast, eggs, and bacon,” or “My usual breakfast is coffee and toast with bacon and eggs.” Stylistic preferences abound. But then I wondered. What about the cereal? Why is it always bacon and eggs for breakfast here in the states? Green Eggs and Ham? Then there’s the bacon. Everybody always loves bacon. Bacon, bacon, Bacon! As someone who has actually read and reread “Charlotte’s Web,” I cannot. So as an adult, I make that personal sacrifice of avoiding Wilbur on the regular. And when I want to talk about commas it makes so much more sense to compare these to cereal. Let me explain for you grammar noobs out there. An Oxford comma is also known as a serial comma. A serial comma. This, my grammar lovers, is what you call a homophone. Don’t get it gnarled, homophones are words that sound the same but mean something typically totally different. 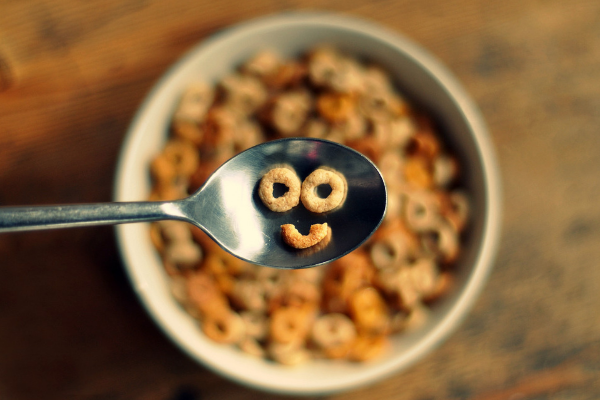 So….see the breakfast food-cereal connection? Cereal comes in a variety of forms. You’ve got diabetes-invoking breakfast cereals like Apple Jacks, Cap’n Crunch, Honey Smacks, and Fruity Pebbles. But what about cereal grains; you can’t forget about those! A cereal grain that you might see served at some hipster breakfast bar comes in the form of a pseudo-cereal grain like buckwheat, chia seeds, quinoa, and hemp seeds. These aren’t really cereals like wheat, oats, barley, rice, and corn or maize, which are more common ingredients in the aforementioned processed and boxed breakfast classics. Now you need to take a look at where you can use your serial commas for connecting long lists of cereals. News flash! If you are writing in British English, as we do sometimes as content writers, you do not need to use the serial comma. That’s right folks. The home of the original Oxford does not actually use the Oxford comma in general and among the common folk. Yes, there is the famous “The Oxford Style Manual,” but it is only used by the Oxford University Press. As for those writers using the Associated Press AP Stylebook and the Canadian Press Stylebook, these say to keep those serial commas out of your content.